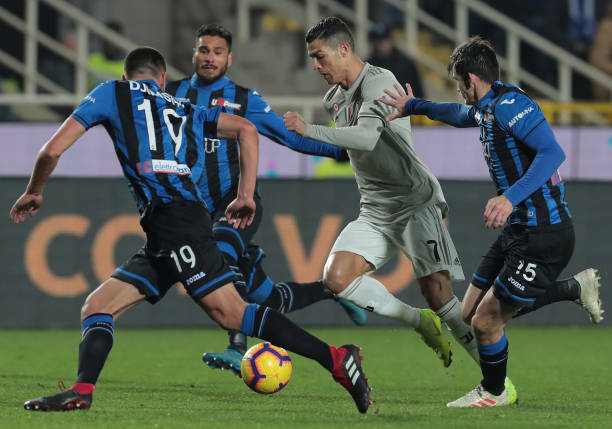 Holders Juventus were bundled out of the Coppa Italia after suffering a 3-0 quarter-final defeat to Atalanta. The home team scored twice in the first half with goals from Timothy Castagne and Duvan Zapata. Colombian striker Zapata claimed his second in the 86th minute his 17th goal in his last 10 games to set up a semi-final against Fiorentina. Juve have won four Coppa Italia titles under manager Massimiliano Allegri. Atalanta took the lead through Castagne goal as he coolly slotted a shot into the bottom corner. Fiorentina beat Roma 7-1 in their quarter-final as Federico Chiesa scored a hat-trick and AS striker Edin Dzeko was sent off for arguing with the referee.